There are good reasons why Nick Piantanida did not factor in Tom Wolfe’s The Right Stuff, but it was not due to a lack of guts. Arguably, the amateur skydiver put together history’s first private space program, but he fell short in his attempts to break the world record for highest parachute jump. Needless to say, falling short is a dangerous prospect when jumping from over one hundred thousand feet in the air. Jeff Tremaine chronicles Piantanida’s bid for glory in Angry Sky, which screens during the 2015 Tribeca Film Festival. Piantanida was a restless non-conformist with a taste for adventure. He had quite the reputation as a basketball player in New Jersey, but he refused to sign a pro contract because he was more or less uncoachable. Thanks to his natural physique and swagger, Piantanida became the first climber to scale Angel Falls, despite his lack of mountaineering experience. He applied the same attitude to his parachuting career, but the results were not so happy. In the mid-1960s, skydiving was quite the exotic pursuit. Naturally, Piantanida took to it like a fish to water. Before long, he became preoccupied (obsessed might be more accurate) with breaking the record for the highest jump. Technically, the title was held by a Soviet. However, USAF parachute-specialist Joseph Kittinger had successfully completed higher jumps, but intentionally declined to participate in the record-certifying process. Piantanidia meant to break both the official and unofficial records, but he would need to appeal to Space Race fervor to raise the necessary support and sponsorship. There was a time when Piantanida was quite the national celebrity, but for most viewers who grew up after the Moon landing, his story will be a revelation. Tremaine presents a scrupulously balanced portrait of Piantanida, suggesting he is a figure of classically tragic hubris. Indeed, those who knew him well, including his widow and brothers, remember him as both courageous and irresponsible. Frankly, it is a far more nuanced and cautionary perspective than viewers might expect from Tremaine, one the co-creators and directors of the Jackass franchise. However, his interest in Piantanida makes sense, given his editorial background in extreme sports. Tremaine uses some brief recreation sequences, which always risk riling up the documentary police, but in the case of Angry Sky, they are easy to identify as such and help convey the tenor of the era. He also scored extended interviews Piantanida’s wife Janice and Kittinger, who intuitively recognized the daredevil’s Achilles Heel. Without question, Kittinger, an eleven month Hanoi Hilton POW, deserves his own documentary, but it is nice to see aspects of his career acknowledged on-screen here. There are moments in Angry Sky that will have viewers shaking their heads in disbelief, even though Tremaine maintains a sensitive tone throughout. 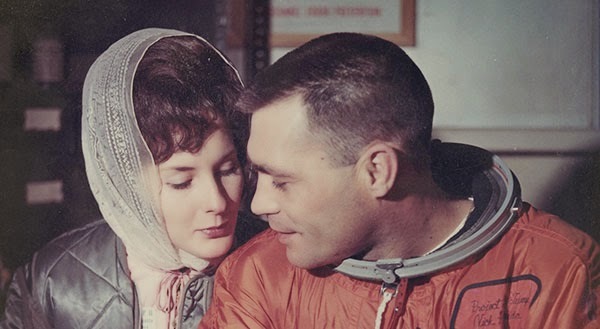 It is downright strange it has taken so long for Piantanida to get the documentary treatment, since his story so nicely compliments that of test pilots like Chuck Yeager and the Mercury Seven astronauts. Give Tremaine credit for recognizing the void and filling it with a compelling film. 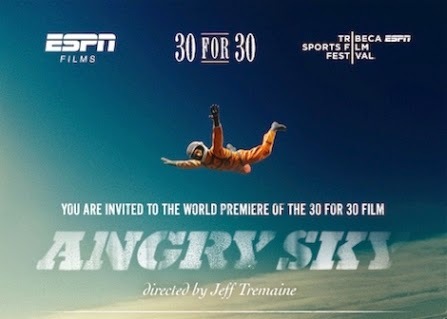 Highly recommended for fans of extreme sports and The Right Stuff, Angry Sky screens again today (4/25) and tomorrow (4/26), as part of this year’s Tribeca Film Festival.